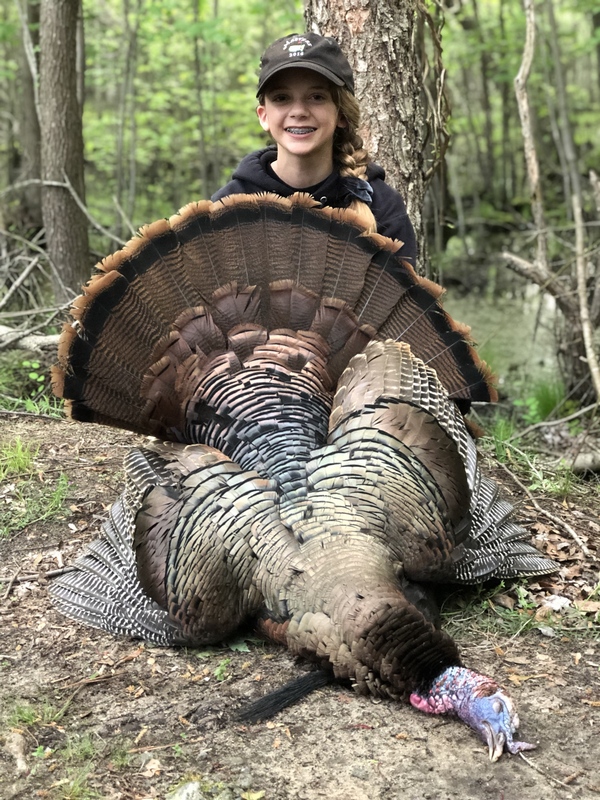 4-7-19 Sons 1st Bird 8yr old. 12 Ga Browning Bps. Rem Nitro Turkey 4s. Jake 5in beard. Randolph Co. Counted 1, 2, 3 boom on these two at 7 am Saturday. They came out of the woodline 200+ yards away. I called and they started strutting, then broke into a run side by side coming to beat up our decoy. Both had 10" beards. Both spurs worn/broke off of the dominant bird. Other had 1 spur about 1 1/8". 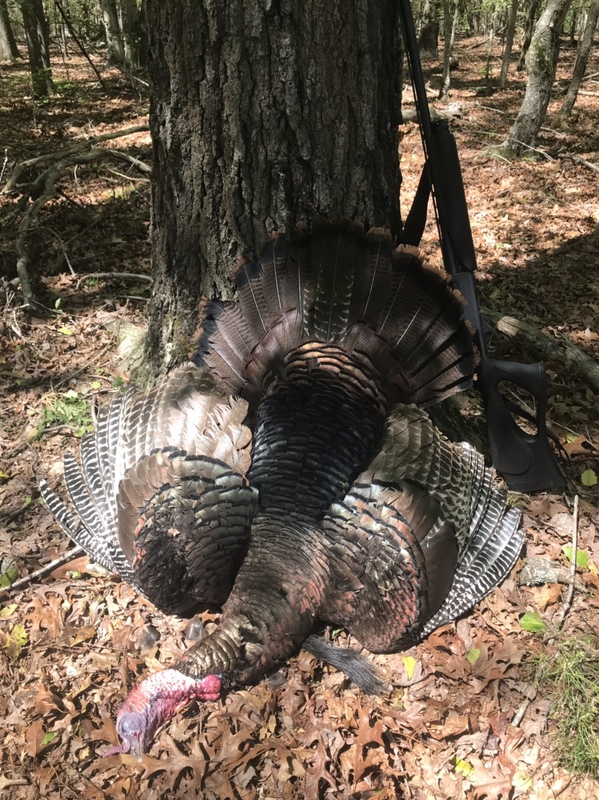 Virginia gobbler. 20.4 lbs, 10" beard, 7/8" spurs. Rem 1100 20 gauge, Federal TSS 3-inch #9s. 45 yds. Killed yesterday (4/13) in damp & foggy Wilkes County at 7:10am. Classic roost to gun kill using a David Hodgkins Brazilian Rosewood Trumpet. Shooting a Steven's 301 410 with a 385 Comp & Choke choke at 37 yds. with Apex 9.5s. My daughter finally got a good opportunity and made it count! 9 1/2" beard, 1" and 1 1/8" spurs. 20ga 3" #5 heavy shot, 22yards. Gobbled a little this morning, but wasn’t too interested. I just got in from NYC this morning at 1, so I backed out and went to the house and got something to eat and took a nap. Came back after I thought they’d be done with their hens. Called twice and three came in glowing red and gobbling. Good day. Thought he was a Tom, but oh well I’m tickled with him!! Older bird I have history with used me by staying on the ridge looking for the hen he heard, expecting her to go to him. This guy came my calling about 25 minutes later and got too close. Buddys Rowan County bird opening day. 1 5/8oz TSS...thank you Hawglips! 4-16-19 Nash County #5 hevi shot. 11” beard, 1 1/8” spurs and 18lbs. 27 yard shot. I was also able to self film, which was much harder than I anticipated but it was worth it! Called up a nice one for my buddy's son this morning at about 7:45. 22 pounds, 11" beard, 1-1/4" spurs. Shot with Rem 870 12 gauge and 3" Winchester Supreme #5s at 35 yards. 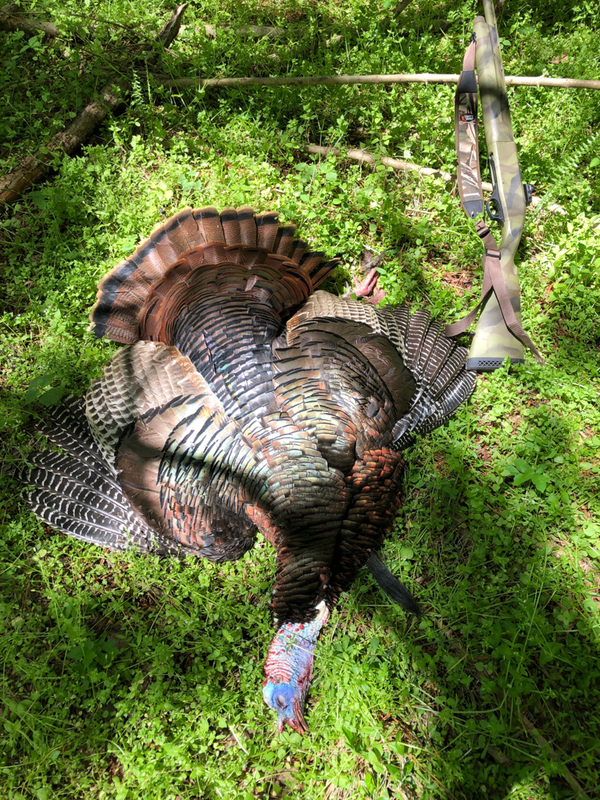 4-13-19, 6:45 AM 19.5 #, 1.5" spurs, 10.5" beard, 35 yds. 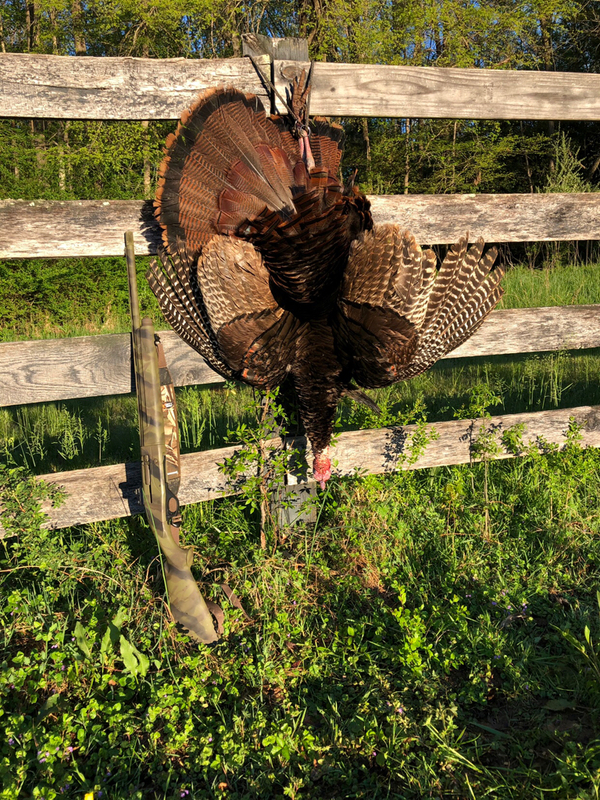 4-15-19, 5:30 PM, 18 #, 7/8" spurs, 10" beard, 25 yds. Va bird - 10.5", 1-1/8 & 1-1/4", 20 lbs. 3” 7/8oz #9.5’s TSS hand loads. Got my first solo bird this morning. 10.5 beard 1 inch spurs. 20lbs. 38 paces with the mossberg 930 longbeard #6 and carlsons choke. Didnt hear a thing all morning decided about 8 to move. Got to the new spot about 9 and thought I heard some gobbling but wasnt sure. Did a little calling some agree yelps and got a gobble but he was in a bottom sounded far away. We went back forth a little and thought he was coming till I seen him 300 yrds away on a hill and said it's over. Next thing I know it pops out about 150 away on full strut and figured that's it he is it in his strut zone. Then I watched him chase another bird around and lost sight of him. He then gobbled 2 times about 175 yrds away out of sight so I yelped aggressively and that was all it took. Between running towards me he he stopped and strutted twice then gobbled at about 50 yards in a little draw. When he came up the draw I put the vortex nlvenom on him and let it fly. While standing there admiring him here comes a hen that I'm guessing he left to come get my decoy.